I got a phone call tonight! I was 20 minutes long! I was so excited to finally get to talk to him again! 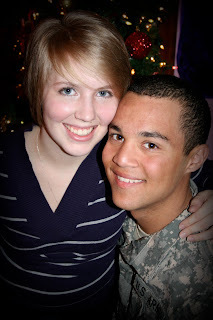 I can not wait til we can finally be together. He was telling me that they went to FOB this week and it was terribly cold. their heater broke on day 2 and their tent froze. so they were out in single digit weather. But they are done so it's all good. :) He said now that they are done with basic everything is totally different. They don't give them as hard of a time with everything, they can eat whatever they want, and stuff like that. He's loving it! I can't wait for the graduation ceremony. 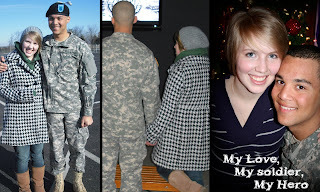 I'm going to be so proud of my soldier!!! YAY! Kendall asked me all about my trip down to Georgia, too. It was nice to be able to tell him a little bit about how it went and the place that I found. That was really nice!! and they should be getting their phones back here in the next few days so that too will be nice. 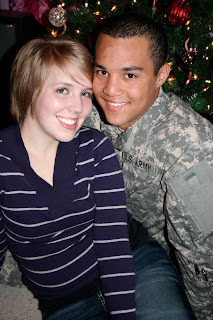 I have to say, I absolutely LOVE being an army wife! The pride I feel towards my hubby is amazing and some of the other wives I've met have been incredible! I love how I cherish our time together way more than I used to. And how God has taught me so much about truly trusting him with everything. Trusting that he has a plan in all the craziness. 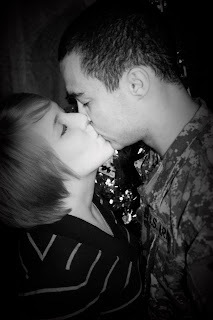 I love when people ask me what my husband does that I can tell them he is in the military. It just really fills me with pride. Plus, I finally feel like I really belong somewhere. Like there is a group of women that no matter where they move us I will belong with. Some of them I have never met, yet I can say i am closer to them than other people. This whole thing has just made me so thankful for everything I have. Thankful for my time with my soldier, for a God that cares so much about me and thankful for a wonderful husband who love me so much!